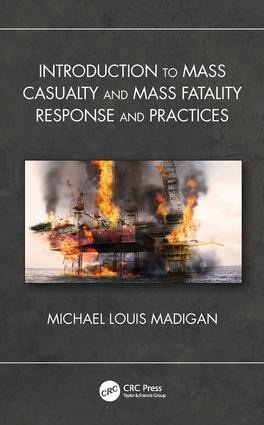 This book covers both Mass Casualty and Mass Fatality and has been prepared for anyone who wants to know about the process, procedures, and management associated with it. The book details the responsibility to protect the public and is based on the latest emergency education information and physical research on what happens in disasters. The book offers a step-by-step emergency management process and discusses the purpose of having such a process in place. It describes what the four pillars of emergency management are, and includes how to assess the risk, the crisis, the consequence, and the vulnerability. The book also includes cyber threats. This book will assist emergency managers, department of defense, fire services, law enforcement, EMS, local, state, and federal governments, and those new to the field, by giving them a step-by-step process to follow and guide them to understanding what emergency management is. Michael Madigan is a master instructor for the Department of Homeland Security for Mass Casualty & Mass Fatality process, procedures, and management to include the Civil Support Teams and Hazardous material emergency response operations on weapons of mass destruction, installation emergency management, and threat assessments to the United States Army Chemical, Biological, Radiological and Nuclear School (USACBRN) on Fort Leonard Wood in Missouri. He is also retired from the United States Army and served as a senior chemical operation specialist to the USACBRN School, CENTCOM, and the Multi-National Forces Command (MNFI) in IRAQ. Mr. Madigan is also a certified fire instructor Level II, hazardous material technician train the trainer, incident command system train the trainer, installation emergency management instructor, WMD/terrorism response instructor, certified ICS/NIMS instructor, and advanced chemical biological instructor.